Now on Hybrid Stereo SACD! 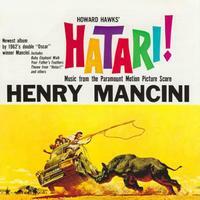 Now Music from the Paramount Picture score Hatari! is back bigger and better than ever! We've gone the deluxe Analogue Productions route — remastered from the original analog tape by Ryan Smith at Sterling Sound and now available as a Hybrid Stereo SACD. This Hybrid SACD plays in both CD and SACD players, as well as all SACD-compatible DVD players. A great title, a brilliant reissue — what could be better? Al Schmitt in his Biography "Al Schmitt On The Record" stated this was probably the most difficult record he has ever done. There were no overdubbing, no click tracks, no isolation booths. Everything was done at one time in one big room. The film composer John Williams, played piano on some of this album.